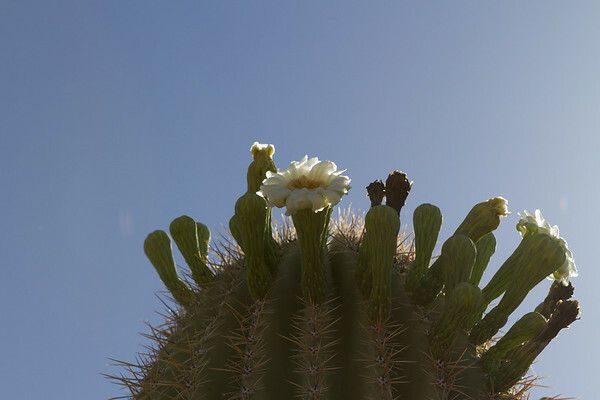 One of the most iconic plants to Arizona is the saguaro cactus (pronounced suh-wah-ro). In fact, its bloom is the state flower. These giant cacti have always fascinated me. They are only found in the Sonoran Desert, which is in Arizona and parts of Mexico. Farther south, there are also giant cacti, one variety is known as a cordon. They look similar to saguaros. A stately saguaro. Notice the blooms on the top, also notice the ironwood tree in bloom behind it. 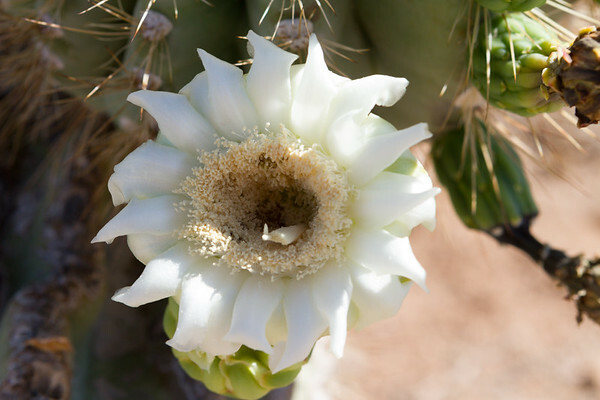 Their blooms are white with a yellow interior, and provide food for bats and birds. If you are fortunate to find an arm that is lower and you can look at the blossom, take a moment and smell it. The blossom smells like fresh honeydew melons. A single bloom, with white petals and yellow stamen. Group of blossoms and emerging buds on an arm. Saguaro fruit is red and provides food to animals and humans alike. I was so happy when we got a home with some land and an established saguaro on the property. I am excited every year to see our big saguaro bloom. Ours is a late bloomer (blooms in mid May rather than late April when the blossoms start to set) and attracts birds for an entire month. First, for the nectar from the blooms and later for the yummy (so I am told) ripe red fruit. 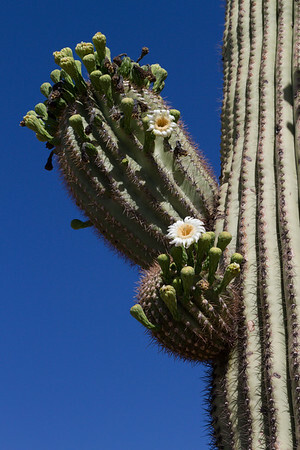 Right now, in the middle of May, saguaro blooming season is in full swing. The birds have already noticed, and the white winged doves are in town ready for the fruit which will ripen in July. Saguaros are mostly pollinated by bats, so Steven and I enjoy seeing the bats flying around at dusk as well. Various holes in the side of the Saguaro. Is it a home to the woodpecker at the top? Saguaros not only provide food for animals; they also provide homes. Some birds will build nests in the “Y” where an arm grows, such as Red Tailed Hawks and Great Horned Owls. Others will live in the "boots" of saguaros, such as the Gila Woodpecker or the Cactus Wren. The boot forms when birds peck at the flesh of a saguaro and damage the skin. The saguaro scars over to heal itself. As the saguaro grows, so does the scar (normally this results in a hole that goes up). This is perfect for birds to nest in as the upward growth instead of downward growth keeps the boot from flooding during spring rains. This arm is drooping and may have been caused by a freeze cycle. It can take a saguaro sixty to one hundred years before it starts to grow its first arm. Some saguaros never get arms. The arm starts off as a small bud the size of a large marble, and in a year, if the water is sufficient, the bud will be the size of a baseball. If there is excessive drought, the new arm will shrivel up and fall off. 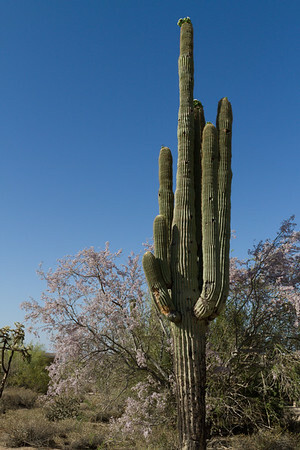 You will sometimes see a saguaro with arms that have turned downward. Some scientists speculate that this is caused by freezing damage. Some of the cells will rupture during a hard freeze and will no longer be able to support the weight of the arm, so the arm twists and lowers. An arm at least a few years old growing on the side of the cactus. A newer arm and an older arm. Saguaros are protected plants in Arizona. Relocated saguaros must have tags on them to be transported and sold. For being so big, they are very delicate. 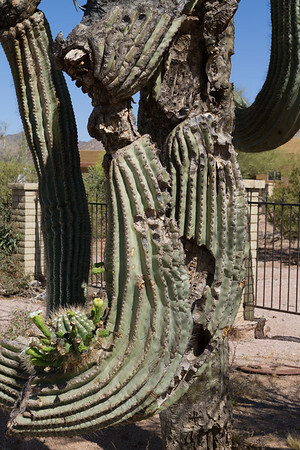 Many larger saguaros do not survive when transplanted. They can live for years on their moisture reserves before they succumb. New buds, blossoms, and fruit forming. Notice how the spines have a yellowish red hue. 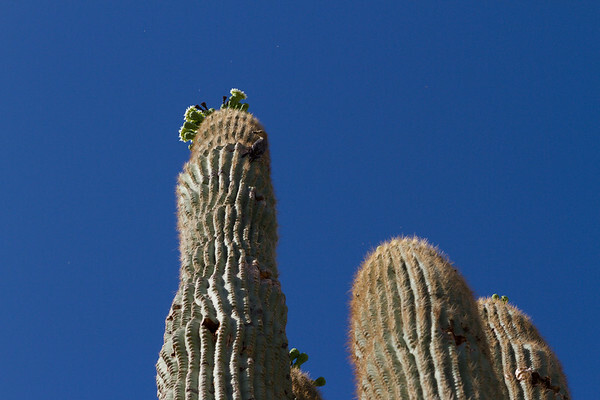 There are just so many interesting things about saguaros that I only touched upon a few. 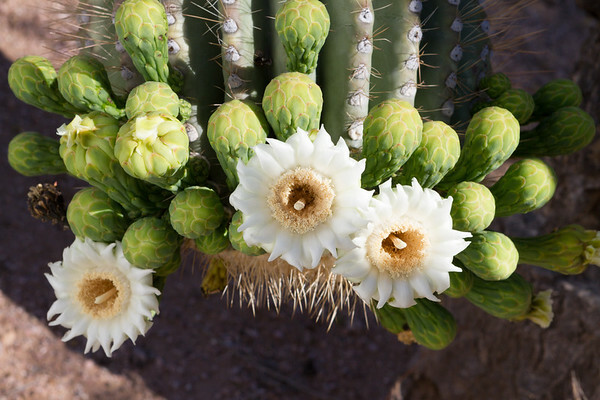 For a fact sheet on Saguaros, check out the National Park Service Saguaro Fact Sheet. I hope to see YOU, under the Western Skies. With Dori and I moving into the new house and setting up our outdoor studios, one of the things we have been trying to determine is what to do with an existing pathway in front of our house, that we are sure the builder wanted to use to place a fountain in. With our goal of attracting native wildlife and trying to emulate the feel of the Desert Botanical Gardens, we did not feel that a general fountain would blend that well, so we thought maybe a statue that could tie in with our wildlife photography. The problem is choosing the right animal to represent our work. I really enjoy grizzly bears and bison, but they really did not "blend" into an Arizona Desert that well, so we thought a life size Bighorn Sheep would be great, as we do not live very far from them, and as a matter of anecdote, bighorns have been seen about 3 miles north of our house at Usery Park recently. So with those thoughts in mind, I had been spending more time trying to photograph bighorns, and am still waiting for the classic shot of the Rams butting heads. Another item that intrigued me, and has actually lead me to start these natural history blogs, was a Facebook posting that was sent to me last year about Bighorn Sheep being in the Wildcat Hills of Nebraska. This was where I grew up, and Nebraska Game and Fish has reintroduced bighorns into this range of hills in the western Nebraska panhandle, as well as the Pine Ridge region in northern Nebraska. I periodically return to the Scottsbluff region and in March I was heading there, so I started researching the reasons for the reintroductions. What I found was that up until the turn of the 20th century, there was a subspecies of bighorn, called the Audubon Bighorn, that lived in the Dakotas and western Nebraska. 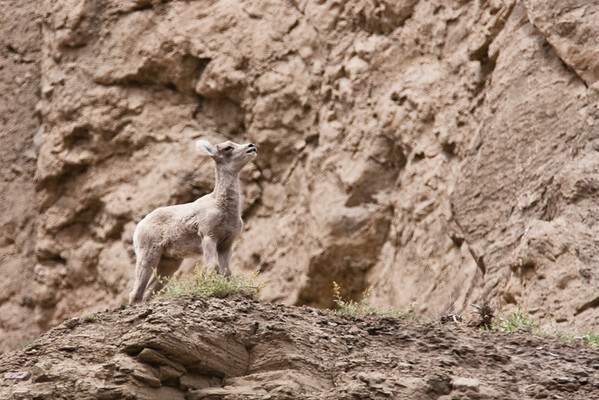 So I decided that I would start with Bighorn Sheep in general as the subject of my first Natural History Blog. Generally, there are three types of Bighorn Sheep in the world, the Rocky Mountain Bighorn and subspecies, the Dall Sheep and subspecies, and the Siberian Snow Sheep found in Russia. The Rocky Mountain Bighorn's taxonomic name is Ovis canadensis, where the Dall is Ovis dalli, and the Siberian is Ovis nivicola. Until recently, it was thought that there were seven subspecies of Rocky Mountain Bighorn: Rocky Mountain Bighorn (Ovis c. canadensis); California (Ovis c. californiana); Nelson's (Ovis c. nelsoni); Mexican (Ovis c. mexicana); Peninsular (Ovis c. cremnobates); Weem's (Ovis c. weemsi); and Audubon's (Ovis c. auduboni) (thought to be extinct). However, in 1993 several scientists started evaluating the species and now believe that there is only three distinct sub-species; the Rocky Mountain; Sierra Nevada (Ovis c. sierrae); and Desert (Ovis c. nelsoni), with the Sierra Nevada sub-species considered endangered. I was most interested in the discussion on the Audubon's, as on my trip to Nebraska, I was fortunate to see a couple of the rams that had been reintroduced. Although, I was able to snap a picture, they were too far away for any good shots. When I returned home, I was able to do some research, and currently taxonomists believe that the Audubon's were actually Rockies that had moved down the river drainages from the Rockies and established themselves in the Dakotas, but were unlikely to be significantly different in genetics. Bighorn sheep tend to be about 3 to 3 1/2 feet tall at the shoulder. The Rocky Mountain males weigh about 200 pounds and are about 5 1/2 feet long. Females are smaller, but from a distance typically appear about the same size, although they typically weigh about 150 pounds. 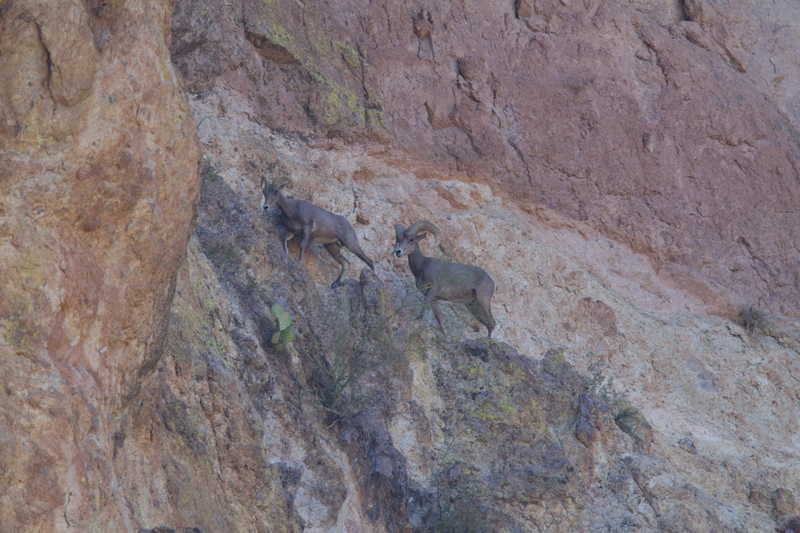 Both males and females have horns, but the females horns are smaller, while the males contribute to the name Bighorn. They have horns and not antlers, as they never lose them, and they actually continue to grow their entire life. Males can be aged by looking at the horns. Each year during the rut, the males tend to quit eating as much and the growth in their horns slows down. During this time, the horns will develop a dark ring , and these can be counted. Typically, you cannot start counting until the 3rd or 4th year. By the 5th or 6th year, the horn has curled around to being below the eye, and is known as a three quarter curl. 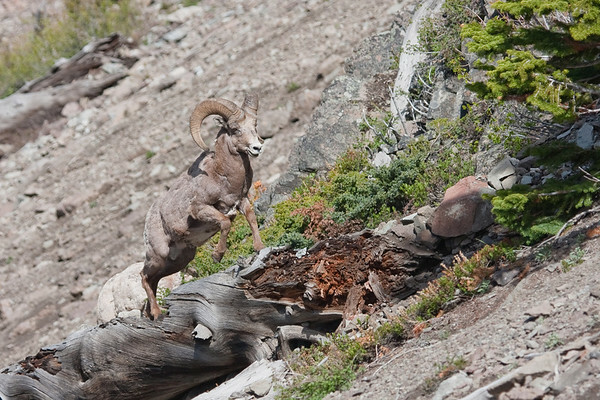 Rocky Mountain sheep typically enter the rut, or breeding season, in November and December. During this time, dominant males will compete for females and the right to mate, and this is when we have the classic views of two rams butting heads (still looking for that shot). After the mating season, the herds break up with the males forming bachelor groups. The females remain together along with the juveniles, including younger none mating males. The females typically have their young in late May to early June and give birth to one or two lambs. The births are timed to match up with the emergence of the spring growth, and provides the best opportunity for the mothers to successfully raise their young. Females typically enter breeding age around two years of age, while the rams are likely capable of breeding at 6 months, but typically do not start until 3 years old, primarily due to the dominance by the older rams. The desert subspecies is similar in all respects, but are a little smaller than their northern cousins. 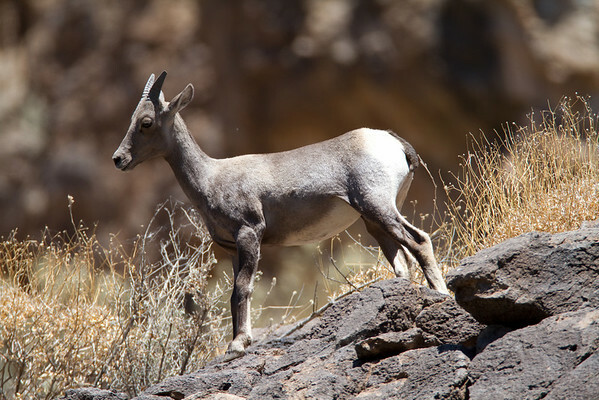 The desert sheep have evolved and changed their rut to occur at a different time of year. Their rut tends to occur in the middle of the summer, from late June to August. This allows the ewes to lamb in December, which tends to correspond with the winter rainy season in the deserts and when there is the most new growth. Their herding characteristics are the same as the Rocky Mountain sheep of the north. Bighorn sheep typically eat grasses, but may eat woodier plants. In the desert regions they will feed on Jojoba and various cactus. The bighorns typically reside in areas that are fairly rugged vertically. They will forage in the flats at the base of the hills, so if they spy a predator they can quickly run up the hill and cliff to escape. Their hooves provide the ability of climbing so well. They are concave and elastic, much as a rock climbers shoes, to grip the rocks as they race up the hill. Their primary cause of death is falling. Even though they are confident in running up a cliff, they will often fall to their death. In the wild, the sheep will live to 7 or 8 years old, with the occasional 15 year old. Mountain lions are their primary predator as adults, but coyotes, bears, and golden eagles have been known to attack lambs. 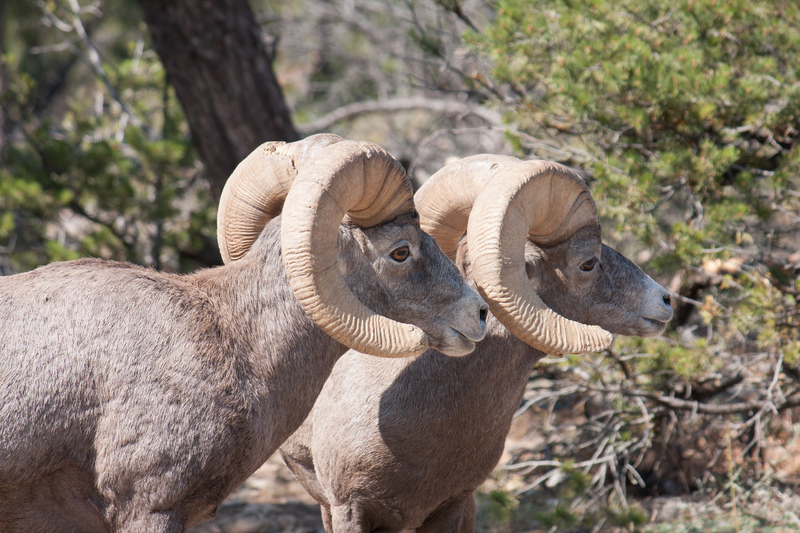 There are numerous places you can see Bighorn Sheep across the western United States. I have seen Rocky Mountain Bighorns in Glacier National Park (NP), Yellowstone NP, Rocky Mountain NP, on the outskirts of Colorado Springs, CO, Glenwood Springs, CO, as well as the Wildcat Hills in Nebraska. 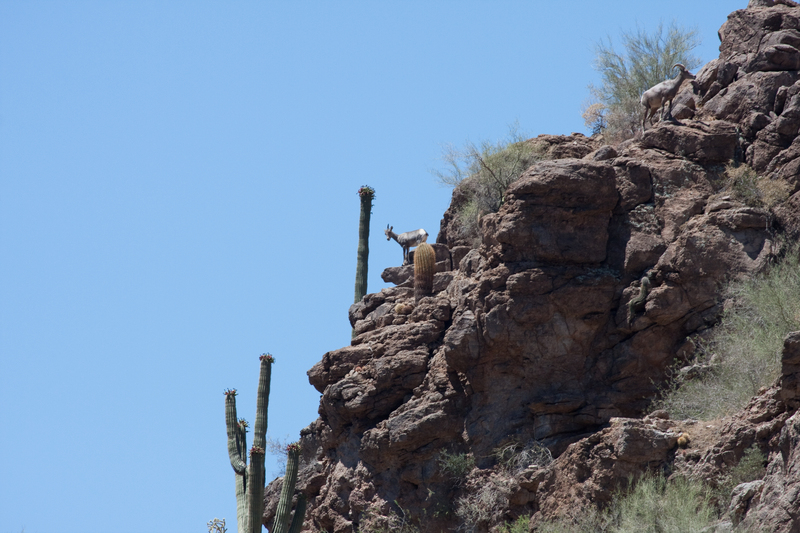 As for Desert Bighorn Sheep, I have seen them at Canyon Lake near Phoenix, AZ, Grand Canyon, NP and Zion NP. Some other areas to look for sheep are Badlands, NP in South Dakota, the Pine Ridge in Nebraska, Arches, NP in Utah, and Boulder City, NV. I wish you luck in finding some sheep to watch, and if you have any questions drop me a line. 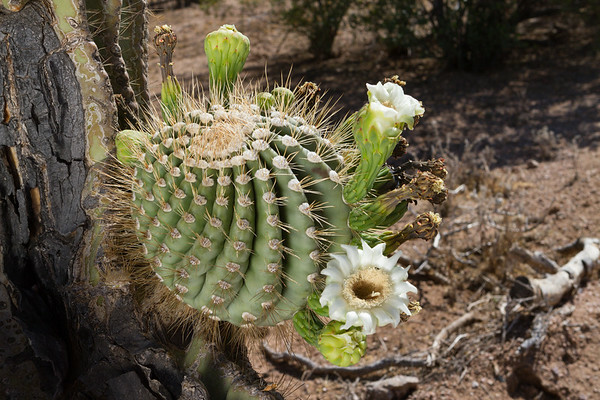 Check back next week for Dori's discussion on Saguaro Cactus.